Here we have a triple giveaway, one with the giveaway form below, one on instagram starting this afternoon, and one on Facebook live tonight (7/7). Check them all out if you're a fan of Spiderman. Good luck. The giveaway form one ends on 7/17 and is US only. Good luck. I've teamed up with Mrs. Kathy King to celebrate the theatrical release of Sony Pictures & Marvel new film SPIDER-MAN: HOMECOMING - In Theaters NOW. 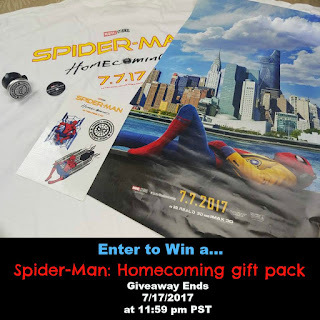 Link for Giveaway Image Above We are giving our fans 3 different ways to win 1 of 10 Spider-Man: Homecoming gift packs that includes a Tee shirt, movie poster and more. Join Mrs. Kathy King on Monday July 7 (7/10) from 6:30 PM - 7 PM PST on Facebook Live for a night of Trivia and Prizes!! !